This module allows users to explore the flood forecasting process by assuming the role of a visiting hydrologist intern at the National Hydrologic Service in Main Country. Fictional senior hydrologists guide the intern through an idealized flooding event that takes place over Main Country's Mainstem river basin and its tributary basins, each with varying landscapes and observation systems. Users will examine how these variations impact the quality and type of forecast that can be achieved. Users will also learn about common problems encountered in flood forecasting, and how to adjust forecasts accordingly. This module is intended for a diverse audience that uses a variety of observing and computing technologies, and builds upon material covered in the foundation topics of the International Basic Hydrologic Sciences Course. These core foundation topics are recommended as a prerequisite since this module assumes some pre-existing knowledge of hydrologic principles. I found it difficult to find answers that were exact to the questions. Required use of the internet to help. It was dope. No suggestions or recommendations. Keep doing ya thing. questions with tick box are little bit confusing and not specific. Very interesting.if legend have been provided for clear cut area,it will be bit easier to solve.knowledge packed.Thank you all.Gained a lot. I think flood Forecasting Case Study is good Forecaster. 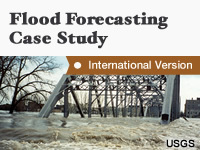 Flood Forecasting Case Study is very important for Flood . poor map alignment and very long worded. Insufficient data to understand the concept. Needs improvement. The concepts are not explained clearly particularly about Numerical Weather prediction models. these are all excellent training for education, and on the job training. The module can have subjective opinions in response to the queries posed in the dummy exercises; considering the previous modules covered. Could be made simpler for a better understanding.